The Award for Excellence in Multicultural Aging recognizes organizations that have demonstrated high-quality, innovative programs enhancing the lives of a multicultural aging population. The nominee organization or program must be an ASA and NOMA member; their program should have a successful track record, and have been in existence for at least one year. Nominee programs will be evaluated on the program’s potential for replication, whether or not the organization is involved in partnerships or coalitions with other groups, and the involvement of consumers and volunteers in program design. The winning program will be featured in the Aging in America Conference program book, in AgeBlog, and on this page. The award is typically presented during the NOMA Program and at the opening general session at the annual Aging in America conference. The nomination site for the 2019 Award is closed. Please bookmark this page and revisit it in June. The Healthy Eating Healthy Aging (HEHA) program was first developed in 2016 by the National Asian Pacific Center on Aging (NAPCA) in Seattle. Designed to provide a culturally and linguistically appropriate healthy eating education and nutrition program to Asian American and Pacific Islander (AAPI) adults ages 55 and older, HEHA focuses on nutrition education that helps to prevent chronic diseases, especially cardiovascular illnesses. 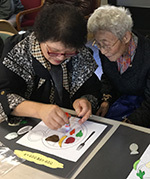 NAPCA implemented the HEHA program in more than 17 cities across nine states, providing at least six hours of classroom nutrition education to approximately 4,000 older AAPI adults having limited English proficiency, and using materials translated into seven AAPI languages. The older adults were taught about the benefits of consuming more fruits and vegetables, how to prepare nutritious and reduced-sodium meals at home, how to limit consumption of processed food, and how to interpret nutrition labeling. NAPCA collaborated with 19 AAPI-serving community-based organizations, and used a train-the-trainer model to train more than 50 facilitators from the partner organizations. To measure outcomes, NAPCA conducted pre- and post-test surveys with program participants. Participants exhibited a change in eating behaviors, increased nutrition awareness, better understanding of health risks associated with sodium and a better understanding of nutrition labels. Finally, all collateral materials were embedded into NAPCA’s National Resource Center on AAPI Aging, so that the aging network and AAPI community-based organizations would have unlimited access to resources.